The Primate of the Anglican Communion, Most Revd Nicholas Okoh has called for a credible election that would make Nigeria better. This is even as the vice Presidential candidate of the Peoples’ Democratic Party (PDP) and the Governor of Delta State, Sen. Ifeanyi Okowa called on Christians to participate actively in the process. 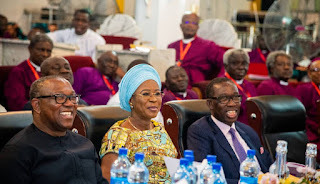 They made their positions known in separate addresses delivered at the Standing Committee meeting of the Church of Nigeria (Anglican Communion) held at St. Andrew’s Cathedral Church, Warri, Delta State. “As we go again for another decisive moment for the future of this country, we appeal to all eligible voters to resist every inducement tended towards buying votes as this will spell doom for all of us in the coming years. “We appeal to the Independent National Electoral Commission (INEC) not only to maintain the posture of unbiased umpire in this exercise, but to be verifiably seen to be doing so in every part of the country throughout this election. “We call on the youth to refuse to be used to create chaos by men and women whose children have been taken to safety outside the shores of the country. “INEC officials, political parties, their representatives, members, general electorates and of course, the votes must be protected without partiality,” he said. The leader of the Anglican Church in Nigeria reminded all contestants that they were under God and charged them to allow the election process to be free and fair and also be willing to accept the results of the election. For the PDP Vice Presidential Candidate, he charged Nigerians to always remember that they had no other country and as such it was important to work and pray for the best for the country. In his speech, Gov. Okowa urged the church to stay resolute in the place of prayer and not shy away from strongly and actively participating in the electoral process. “We have the Biblical examples of Daniel, Elijah and Esther whose fervent intercession provoked God’s mercy, blessings and judgment, to encourage us to stay strong, especially in a time like this.